Now that you have researched breeds of dogs and determined that the Greater Swiss Mountain Dog ("Swissy") is the best fit for your family and lifestyle, how do you go about actually finding a puppy (or adult) to purchase? First, find a responsible breeder! A responsible breeder is interested in producing sound healthy dogs with good temperaments and appropriate breed type, as described in the American Kennel Club (AKC) Breed Standard developed by the Greater Swiss Mountain Dog Club of America (GSMDCA). The responsible breeder has invested their time (often many years) and money learning about the breed. They exhibit their Swissys in conformation and working events, assess the proper temperament for the breed, and research and test for breed health concerns. This allows them to select only the best Swissys as breeding candidates. One of the best ways to find a breeder is to attend dog shows (conformation) and working events, where you will find breeders and fanciers exhibiting their Swissys. Most exhibitors will be happy to spend time talking with you about their Swissys – either after the completion of showing or at scheduled break times. Breeders who show and compete with their dogs are generally more knowledgeable about the breed and have a vested interest in improving the breed. The internet can be a valuable source of information about the breed and breeders. A listing of breeder and fancier contacts, as well as general breed information, can be found at the Cascade Greater Swiss Mountain Dog Club's (CGSMDC) web site,http://www.cascadeswissyclub.com. The GSMDCA's web site, http://www.gsmdca.org, also lists breed and breeder information. Additionally, a number of breeders and fanciers have private web sites that can be located through the use of popular search engines. While responsible breeders can be found on the internet, irresponsible breeders who want fast sales with few questions asked also thrive here. A beautiful web site is no guarantee of a responsible breeder. To sort out the responsible breeders, ask lots of questions and insist on clear, verifiable answers. The best approach is to find a local breeder that you can visit and personally assess the dogs and their living environment. It is best to speak to a few different breeders and evaluate their practices and commitment to the breed before you view any litters that are available for purchase. Otherwise, it may be too tempting to purchase the first cute puppy that you meet. Your Swissy companion will be an integral part of your family for many years; time spent now could save much heartache and expense in the future. How long have you been in the breed? Do you show your Swissys in conformation, obedience, performance, and/or working events? How many Champions have you bred? What titles do your Swissys hold? Length of time in the breed and success in exhibiting are often indicators that the breeder has invested the time, effort and resources to learn about and understand the breed. If a breeder is a relative new comer, ask about their mentors, who will have helped guide them in their knowledge of the breed. What breed clubs do you belong to? Responsible breeders want what is best for the Greater Swiss Mountain Dog breed, so they associate themselves with organizations that seek to protect and improve the breed, such as the GSMDCA and CGSMDC. Through these organizations they can focus their efforts for the benefit of the breed and meet other concerned Swissy owners and breeders. What long and short-term goals have you defined for your breeding program? The only justifiable reason to breed is to preserve and enhance the breed. A responsible Swissy breeder will have a well-defined reason for every breeding, such as improving a line or solidifying and perpetuating traits they have already produced. A responsible breeder will never be breeding just to have puppies to sell! What titles and health clearances do the sire and dam of the litter have? Responsible breeders show and title their dogs. If the sire and dam do not have any titles, ask why. While there are certainly wonderful dogs that haven’t been in the show ring, a breeder who is trying to improve the breed will best be able to do so through evaluation against the standard and comparison to other Swissys both at dog shows and working events. Responsible Swissy breeders obtain health clearances on their breeding dogs. At the very least for the breed’s Canine Health Information Center (CHIC) required tests, currently hips, elbows and eyes. It is preferable to additionally test shoulders and some breeders will perform patella, thyroid and cardiac tests as well. Health clearance information can be viewed at the Orthopedic Foundation for Animals website at http://www.offa.org or the GSMDCA's website at http://www.gsmdca.org. What faults do the sire and dam have? What are their good points? Every Swissy has some faults, or deviations from the written standard. Fault does not necessarily mean defect. A fault can be as minor as unacceptable eye color or mis-marking(s). Avoid the breeder who represents to you that their dogs do not have any faults. Specifically ask about any health problems the sire and dam have or have within their pedigree. The sire and dam should not be exhibiting any significant health problems if they are being breed. Be aware, however, that there are genetic health issues (bloat, torsion, epilepsy) behind every line of Swissys if you look far enough back in the pedigree. Any breeder that tells you there are no health issues in their pedigree is either not telling you the truth or has not researched the pedigree in enough depth. Be skeptical about anyone who seems to always have puppies available or has a puppy available right now (without a good explanation). It is usual in this breed to be placed on a waiting list for a future breeding or puppy. It is not common to be able to receive a puppy immediately upon request. Swissy litters take a tremendous amount of time, not just in their care and feeding, but also to do the amount of socialization that is necessary. Early socialization is extremely important for a Swissy. Failure to socialize can lead to serious problems later on. Breeders that have an excessive number of litters are probably not able to spend the time necessary to properly care for each litter. Are the breeders planning on keeping a puppy from the litter? If not, why? If yes, how will they pick which one to keep? How is the litter graded for show/breeding prospect puppies and companion puppies? Responsible breeders are breeding to improve or continue their breeding programs, so often breeders will plan to keep a puppy from each litter. A responsible breeder will have a good reason for every breeding, and will be able to tell you how puppies in the litter are graded as either show/breeding prospects or companion ("pet") Swissys. Be skeptical of any breeder who states that all or most puppies in a litter are show/breeding prospects. Most litters will contain a very limited number of puppies (often only one or two) that should be designated as show/breeding prospects and placed with the future hope of continuing the breed. Do you have a purchase contract and what are its terms? A responsible breeder will have a written contract that clearly defines the terms and conditions of the purchase, the responsibilities of the seller and buyer, any future requirements the dog must meet, and guarantees against debilitating genetic health problems. Health guarantees should clearly spell out any requirements that you must fulfill to validate the guarantees. Responsible breeders will offer money back or sometimes another puppy if your Swissy develops a debilitating health problem. A guarantee should never require that you return your puppy, as all breeders know that families will not want to return a beloved companion. Such a requirement will effectively prevent you from asking for relief under the contract if you won't comply. A responsible breeder will not require that you show and/or breed your Swissy when you have no interest in doing so. Showing can be very expensive and take your dog away from home for extended periods of time. Breeding comes with a responsibility and commitment to the breed that most companion dog owners should not be expected to accept. If a breeder is pressuring you to accept a show/breeding prospect puppy with or without a co-ownership, when what you asked for is a companion puppy, carefully consider whether that breeder is looking out for your own and the puppy's best interests. Ask the breeder to provide you with a copy of their standard contract before you ever see the litter, thereby giving you adequate time to understand and ask questions about the contract. NEVER sign a contract that you do not understand or are not completely comfortable with! After you have completed your screening process it is a good idea to visit those breeders that you are interested in working with. A responsible breeder will invite you to visit their dogs and home, so that you can further assess the breed and its suitability for your family. While it is very worthwhile to visit Swissys and their owners at dog shows and events, you will obtain a more complete understanding of what Swissy temperament is like when visiting them in their home environment. The time that you spend at a breeder’s home will also allow the breeder more time to get to know you and your family. A responsible breeder will be as interested in getting to know you, asking questions about your family and lifestyle, as you are in getting to know them. Responsible breeders want to be absolutely certain that a Swissy is the right dog for you and that their puppies will be a good fit in your home. Be very skeptical of a breeder that is not taking the time to learn about you and only seems interested in making a sale. During your visit assess the living conditions of the breeder’s dogs. Do they have adequate living space and room to exercise? Are their quarters clean and well kept with fresh water available? Are the puppies raised in the house, so that they become accustomed to the normal noises and activities of a household? If the puppies are not raised in the house, has the breeder spent adequate time socializing them? Do the puppies have adequate room to play and interact, and opportunities to learn how to handle new situations? Puppies should have been exposed to people, dogs, new situations, normal noises and all sorts of other activities. This helps ensure that they do not grow up shy and fearful. Specifically ask to visit the dam of the upcoming litter and if possible, the sire. The sire will often belong to another breeder so you might have to make another trip to be able to visit both parents. Ask to visit any other relatives to the litter (grandparents, aunts, half-siblings) that might reside with the breeder. Assess whether you like the temperament, appearance and health of the dam and sire, if not, do not consider getting a puppy from the litter. Most often puppies will grow up to look and act very much like their parents. Question any breeder's claim that some trait - which the parents do not exhibit - exists in the pedigree and will probably pass on to the puppies. For example, an undersized Swissy has a greater chance of producing undersized Swissys than do parents of a more normal size, regardless of the size produced further back in the pedigree. Conversely, a parent with hip dysplasia has a greater chance of producing puppies with hip dysplasia than do parents without this problem. If there are very young puppies present, do not be surprised if the breeder will not allow you to interact with them. Puppies under 4 weeks of age are more susceptible to illnesses, and breeders do not want to take any chances that outsiders might inadvertently bring in dog diseases. Breeders will certainly encourage you to visit with their older puppies, as it is great for their socialization. Once you have located a breeder which you wish to obtain a Swissy from, ask to be placed on their waiting list. You may wait on a responsible breeder’s list for many months before a puppy from a litter that has the qualities you are looking for arrives. However, be patient! A quality puppy that will give your family many years of enjoyment is well worth the wait. Buying the first available puppy from a questionable breeder can often lead to much heartache. There is nothing wrong with placing your name on a few different breeders' waiting lists as long as they are aware that you did so. Notify all of them when you do obtain a puppy, so that they do not believe that you are still waiting for one of their puppies when you are not. If a breeder requires a deposit to place you on their waiting list make sure that you understand the conditions of that deposit and whether it is fully or partially refundable if you do not purchase a puppy. Buy from a responsible breeder that is committed to the welfare of the breed and their own dogs. 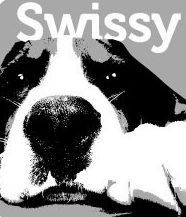 Do your homework, ask lots of questions, and review health certifications and the breeder's contract before you ever consider purchasing a Swissy. Be patient, you are looking for a beautiful, loving new family member!